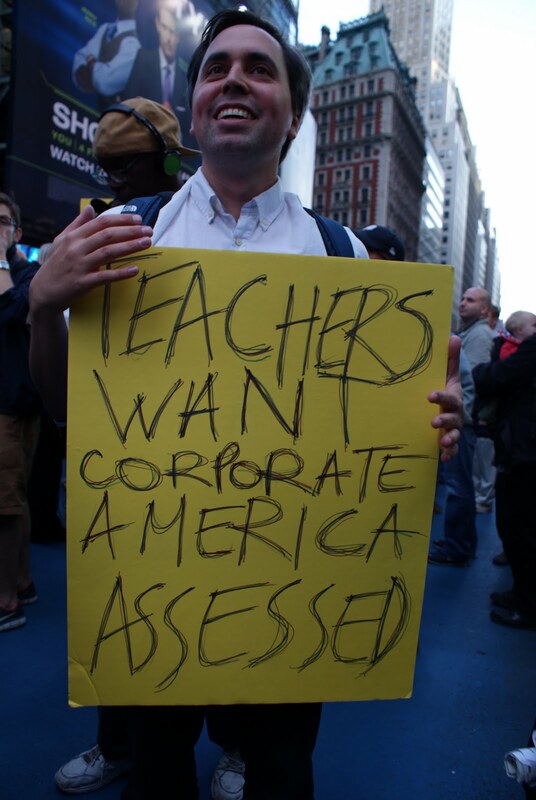 The message was loud and clear -- it is time for educators to turn the table on the corporations and politicians and begin evaluating, measuring and assessing their performance. Here are some well-known statistics: 25 million people are out of work or underemployed, 50 million people have no access to health insurance and one in five children in the U.S. is living in poverty, with four of every ten black children living in poverty. Everyone but the wealthy has become part of corporate America's collateral damage, and the country appears poised on the brink of calamity. So far the protests have been relatively peaceful, but unless the deep and widespread concerns jar loose some real change, if history is any guide, the anger and outrage will not remained contained. Despite the potential consequences of joining in the protests (like being fired), teachers are also standing up and participating in the OWS movement. Teachers have finally had enough. After years of blame for students’ low test scores in a country that has no accountability for the perpetrators of endless wars and the economic meltdown that make teaching evermore challenging, teachers are beginning to loudly call out those in power and to reclaim their voices that have been muffled by years of threats and sanctions. Since its inception in 2002, teachers have known that No Child Left Behind was bad policy, but no one was listening or even cared. In fact, anyone who voiced opposition was accused of engaging the “bigotry of low expectations,” even though today’s officialdom now acknowledges the criticism of impossible testing targets was, in fact, true. Boredom and terror among young children who no longer looked forward to school but instead anticipated another day of rote exercises and practice testing designed to increase scores by a point or two. What a difference a few years makes. OWS has catalyzed a long overdue conversation about the abuses of corporate power and, it is the spark that has also ignited the pent-up anger and frustration brewing in the education community for a decade. The pushback against corporate abuse in all areas of our lives, including education, is well underway and gaining momentum. In the past year, three newly established grassroots education movements have been organized as parents, teachers, and citizens begin to focus on ending the reign of terror in schools. Save Our Schools and National Call to Action held a Rally and Conference in Washington over the summer and is now a national organization with chapters in more than 30 states. Parents Across America and United Opt Out National are gaining traction by shining a spotlight on legislation, generating excitement and political action, and keeping a close watch on the education policy positions of candidates running in local school boards and all the way to Congress. What they all have in common is a passion for child advocacy and for authentic learning that strengthens our democracy. This translates into their core demands to end the abuse and misuse of high stakes testing and to return to well-rounded curriculums and community control over local schools. These are only three of many organized political groups providing a platform for the millions of Americans who see how the unrestrained greed of corporations has hijacked the country and our political leaders. These patriotic citizens are passionate and determined, not because of self-interest, but because they understand that the destruction of a sound public education system is a direct assault on democracy itself. They want their country back, they want their professional lives back, and they want their schools back. Parents are joining to support teachers because they see how the test and punish model is aimed at indoctrinating their children into becoming mindless, obedient corporate citizens and consumers. Parents are tired of seeing their children humiliated and used as guinea pigs, measured, assessed, and labeled as early as kindergarten. And teachers with a conscience that their professional integrity demands are no longer willing to mindlessly execute orders from powerful moneyed interests that are harmful to their students and their profession. Amidst all the chattering on TV about education reform, teachers are hard at work each day in overcrowded, dilapidated classrooms with meager supplies and budgets. Many teach in classrooms with hungry, anxious students who lack health care and safe neighborhoods. Other teachers are seeing more homeless students whose parents lost jobs or have been deported because they came here illegally. Teachers will continue to teach children who might have one or both parents overseas fighting in Afghanistan. Despite all this, teachers continue to do whatever is necessary to care for their students. Teachers now find themselves as the last line of defense in the battle for the souls of our nation's children. That's why teachers will continue to occupy Wall Street and Washington, Trenton and Oakland, Knoxville and Raleigh, as they turn the tables and demand accountability for the crimes against children being committed in the name of education reform. They are finally standing up to the bullies. As Congress debates No Child Left Behind and the future role of the federal government in education, this time around teachers and parents are no longer going to be silent, sitting on the sidelines. They are going to be marching in the streets, protesting, calling their congressmen and senators and making their voices heard. Teachers are finally demanding the freedom to teach and the professional autonomy and respect that they deserve. We can do better! Join one of the many organizations fighting for the future of our children and our nation. Go to their websites, make a donation, and get involved.